If you only read this section of the review, you should leave here as a huge fan of the new FactorXBag. This bag is labeled as an “everyday backpack”, but it is so much more than that. I am always on the search for a bag that can blend in with my daily activities, yet come through in a SHFT or emergency situation. If an EMP or natural disaster where to occur right now, would you be prepared? Would you have the basic supplies to keep you safe while you worked your way to your home or bug-out location? 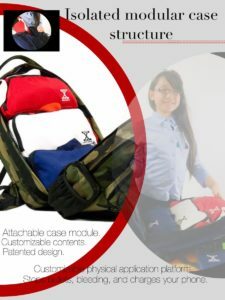 The FactorXBag can play an instrumental role in your ability to thrive and survive during any emergency. 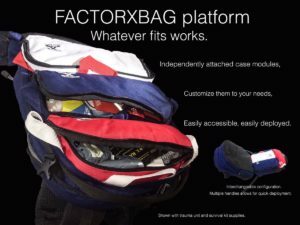 One of my favorite aspects of the FactorXBag is that it can be personalized in so many ways to fit your exact needs. 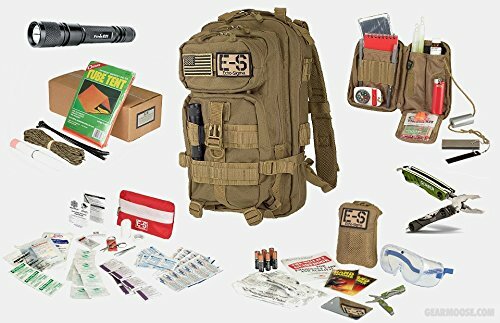 This bag can be your 72-hour car kit, your quick-action trauma kit, or your key to surviving an active shooter scenario. In this day and age, everyone has their different reasons for wanting to be prepared. No matter your reason for purchasing this bag, you will not be sorry you did. 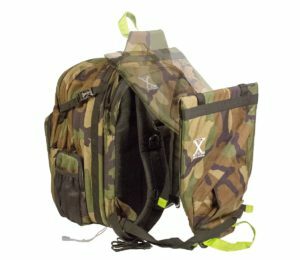 This bag allows you to carry your everyday gear for work while helping you to organize your survival and medical gear in its modular gear system. It allows you to deploy ballistic panels for immediate protection during an active shooter incident, upping your odds of survival. That’s right: With a simple pull of a strap, a pocket opens up, allowing you to pull out a full chest panel that snaps back to the bag, creating a bulletproof vest! This bag has 10 well-thought-out compartments, allowing you to be organized and ready for when the seconds count. 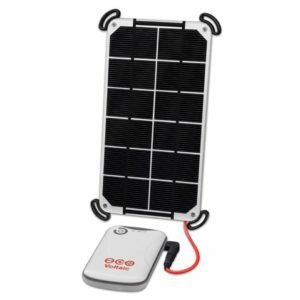 The pack is solar capable and allows you to hang a charging panel on the outside of the pack. This allows you to create and collect solar power while on the move. 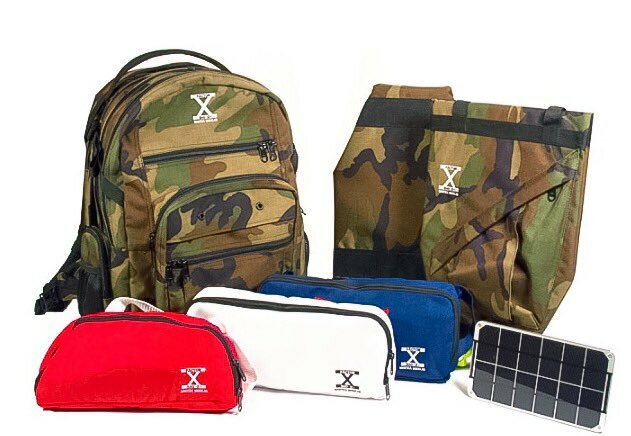 It has a section of the bag built specifically for the storage of this gear and has attachments to hang the solar panel on the front of the pack. This bag is rugged and uses double stitching to increase its ability to handle aggressive wear and tear. The FactorXBag is made with high-quality materials and has multiple interior pockets with zippers to hold your gear in place. YKK zippers on every pocket make it easy to operate, offering you quick and smooth access to your bags’ contents. There is also an interior pocket that can house and protect your laptop, office materials, or even EDC tools. OK, I have to admit that I did get a little “Tacti-Cool” judgmental on this bag when I first saw it online. I am guilty of being a gear snob, and you all now know this about me. My first impression was that the pack looked like a bag from when I was in grade school. This look lead me to question if the bag could hold up to survival situations. I thought for sure that the materials wouldn’t hold up and the pack itself would be too small to carry all of my survival gear. Well, when you are wrong, you are just wrong! I guess I should let this be a lesson to me, as the FactorXBag is comfortable to carry, rugged, and has plenty of room to carry all of my EDC and get-home gear. Despite the appearance of being small in some of the photos, it’s actually very spacious. The 10 compartments really allow for you to organize and carry a lot of gear. Even better: The pack sits comfortably on your middle back, and when the arm straps are cinched down, it almost suctions to your back. Some bags are built with a long torso and end up resting on the top of your hips, which, when it comes to carrying really heavy packs, helps to displace weight off your shoulders. If this were a long-term INCH bag, I would expect that to be the case, however this is not a bag meant to keep you going indefinitely. This bag is meant to get you home, patch you up, and provide you with a meal. Or, it’s meant to give you the upper edge in an active shooter situation. That being said, I was really surprised at how well the FactorXBag sits on my back even when approaching 40-50lbs of weight. 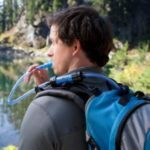 If you have ever done long-range backpacking before, then you will agree with me that a pack that moves or shifts when walking leads to sore shoulders, a hurt back, and fatigue. Because I grew up backpacking, I am always hypersensitive to how a pack rides on my back. When I first put this pack on, I was thrown off by it resting on my middle-back. I found myself constantly loosening the straps trying to adjust it to fit the way my other larger bags have in the past. I guess you could say this was old backpacking habits. To be honest, this might be something only I would fixate on, but I did this for the first few days. Once I cinch the shoulder straps down as apposed to loosening them, I found the sweet spot! Since then, I have done stair climbs and mini hikes with it, and I have had no issues with comfort at all. A few days into finding the sweet spot, it dawned on me that the FactorxBag was designed to sit perfectly in the middle of your back for one extremely important reason. The placement of the pack allows for proper protection from gunfire. The bag’s placement on your back perfectly aligns the bulletproof panel to cover your vitals. The back panel has to mirror the front bulletproof panel for the best-possible protection. Once I realized this, I also realized that Todd had truly designed a comfortable, versatile backpack that was engineered to accommodate my gear needs while offering me the best ballistic protection! After a few more days of carrying the FactorxBag at a multitude of weight levels, I knew this pack could easily accommodate my bug out gear. 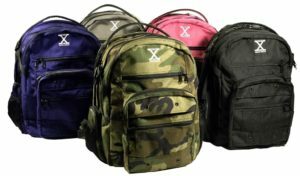 The FactorXBag comes with compression straps on the outside of the bag that allow you to cinch the contents of your pack in place once its packed. The interior zipper pockets and compartments allow you to create organized homes for your gear, which truly adds to how the pack carries on your back. With all your gear tucked away neatly in the pack and a little applied pressure from the cinch straps, you have a very sturdy and comfortable pack. In the second to last compartment of this bag, there is a modular storage system to organize your survival gear. This section has the ability to open up flat in a clam-shell fashion, thus allowing the bag to lay flat and giving you easy access to your gear bags. Across from your gear bags is a half pocket where you can store a few more gear miscellaneous items. I put a few first aid and survival documents in here, as they lay flat and can be pulled out for a quick reference guide for anyone that uses the pack. You cannot always assume that you will be the one to use the gear in your pack. What happens if you are hurt and need assistance from your family member or co-worker? A few simple survival cards or instructions may help until the professionals respond. I really enjoy these compartmental bags, as they help me keep my gear organized and readily available. I don’t have to search through the bag’s pockets or worry about putting gear back in the wrong area when in a rush. Each modular gear bag, when removed, has handles on it that can be attached to the outside of your pack or your belt, like a makeshift fanny pack. These bags are well made, rugged, and versatile. I really appreciate the size of these gear bags, as they force you to really evaluate what gear you absolutely need to carry. They are not small to a fault, rather they are just right for the gear you really need to have on you. If you’re a gear junky like me, the size of these bags will make you reevaluate everything you carry and help you cut down on the overall weight of your pack. If you know you are going into a potentially hazardous environment, you can make a simple-but-effective switch that can increase your ease of access dramatically. For example, if it is day two of your bug out and you know you may be walking by populated areas, you also know your chance for conflict may increase. I of course recommend avoiding conflict at all cost, however in this scenario, you know you will run the risk for a potential encounter. Then you may want your medical gear ready for quick deployment. If this is the case, before you leave camp, open up your modular gear compartment, remove your first aid pouch from the Velcro, and turn it upside down onto the Velcro. This will leave your gear pouch free and easily obtainable. After you close your bag, you are ready to hit the road. Now in this format, you can just crack the zipper on the modular gear compartment, grab the red handle, and pull the med kit out without having to open your entire bag. Also, if there is an emergency, you can have a friend access the side of your pack while you still have it on, and they will be able to just pull that bag loose. This means you can access your gear on the go, with the help of a friend, or on your own in a much more efficient manor. 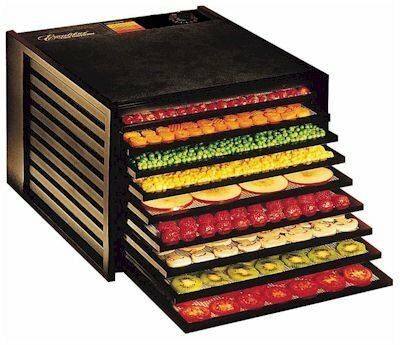 When seconds count, this could be very handy. The FactorXBag is designed in a way that the pack hugs your back tightly, so even in the quick release format, the gear bags will be held in place while you’re on the move. I often have my red and blue bag set up this way, as it’s nice to grab my food or medical gear while on the move. This feature just makes me love this bag even more! How does one carry a bulletproof vest without others knowing? FactorXBag has your solution! Hidden in the last rear compartment of the backpack is a rapid deployment system that holds two bulletproof panels. When you pull on the deployment straps found at the base of your bag, the pocket opens up, giving you access to the neon panel pull handle. (You can see it in the picture to the left.) Once you grab this handle, you can pull out your 11”x14” chest panel and deploy it to cover your front vitals. Attached to this panel are two buckles that you can snap into their counterpart located on the base of the backpack. Once completed, you can tighten the straps to secure your chest panel in-place. This now means you have one panel left in the backpack protecting your back and one attached to your front, providing you with a makeshift bulletproof vest! The front panel has a diagonal zipper on it for extra-quick storage access. You can store maps, basic first aid, extra magazines, or a handgun in this pouch. I prefer to carry my sidearm concealed on my hip, because I believe one should always have total control of their firearm at all times. However, when on the move, it may be nice to be able to have the option for a chest carry. In order to make this possible, I have added a strip of Velcro in this section, so I can store my firearm and an extra magazine for easy access. Many different companies offer velcro /molle single pistol holsters and magazine carriers. Remember, a secure weapon is a good weapon! Like it or not, we live in a digital age and many of our day-to-day items require power to function. When disaster strikes, having the ability to charge a phone or any other USB-compatible device could be crucial for your survival. For example, this 1050 lumen Cree X-PL flash light can be recharged by a USB chord and would be a perfect accessory to the FactorXBag. Having the ability to charge your gear at camp or to create and store power in your backup battery pack while on the move is a strong added bonus. One of the front pockets of this backpack was strategically designed to hold a 3.5 watt solar kit from Voltaic. 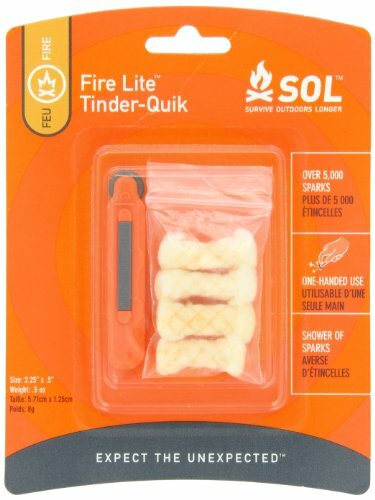 This kit described below fits perfectly into this pocket and comes with a backup battery pack. It is important to note that the front of the FactorXBag was designed with four eye-hole style buttons on the exterior. These buttons can be used to secure the Voltaic Solar panel to the pack, enabling you to collect power while you go about your routine. Once you have secured your panel on the exterior of your pack, you can run a charging cable into the storage pocket located behind the panel. If your battery pack is full and you still have a few hours of daylight left, you could daisy chain your phone or other device to the battery pack located in that pocket. Now as your phone is charging off the battery pack, you will be replenishing that used power from the panel. Todd from FactorXBag is a very hands-on owner and designer. This bag has been his passion piece for the past few years. He has worked incredibly hard to create and deliver this pack to the marketplace. Through his research, he has developed some great relationships and has researched a ton of gear that would work well with his bag. Since preparedness is such a personal journey for most, he created his bag system for people to personalize as they see fit. For example, some folks might like Gerber knives, some might go for CRKT knives, and others might prefer SOG knives. All of these knives are excellent choices and made by excellent companies, however, as humans we always have our favorites. Todd didn’t want to come out the gate with a full-service survival kit, he just wanted to create the bag to satisfy preparedness needs. In my conversations with Todd, he had a lot of great ideas and insights that I found fascinating. So I asked Todd to share a few of his findings with me, so I could include them in my review. I am currently reviewing the products listed below and working with these companies to learn as much as I can. So please stay tuned for full-length reviews in the near future. In the meantime, here are a few things he suggested to me, along with my immediate findings, for your consideration. Where To Get Your Armor Panel? 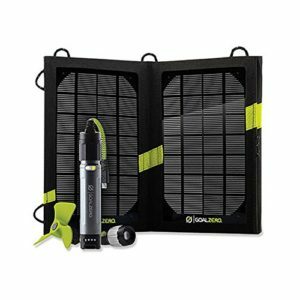 The Voltaic Solar kit is Compact and lightweight, this 3.5 Watt solar panel and 4,000mAh battery provides high performance charging to keep your devices powered up anywhere. Slide the panel in your bag or mount it nearly anywhere for a minimal, tough charging solution. Panel is IPX 7 waterproof, UV- and scratch-resistant. Let’s face it, preppers are some of the most opinionated folks out there! Everyone has their favorite gear, the best way to do something, and the absolutes on how things will go down. Prepping is a personal process that people can become obsessed about. When someone becomes obsessed, they often lose the ability to see gray, and that becomes dangerous. So of course everyone in our lifestyle will have a ton of ideas on what is best for everyone. However, here are just a few of our gear suggestions for you to consider when personalizing the FactorXBag. It can be hard to know which kits to buy and which kits to pass on, so we did some searching for you! A word to the wise: Medical kits are not an area to be cheap on! There are some fantastic deals in the market, you just need to know what to look for. We will not go into those details in this review, however these are some readily available kits from Amazon to get you started. You can personalize these kits as you learn and train more. However, they are a great starting point for anyone wanting a great personal medical kit. Full disclosure, you must get training when it comes to anything medical. Watching a few YouTube videos and reading books will only take you so far. As a self-reliant person, you should take the time to learn from experts in your local community. Do not put this off, it could save a life. 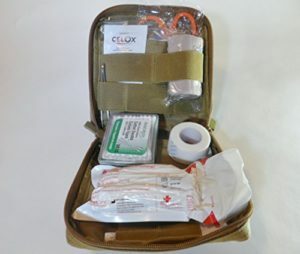 INDIVIDUAL FIRST AID KIT,180 Piece IFAK, Emergency Medical Trauma Kit complete with Israeli Bandage and BLOOD Clotting agent in 1000 D MOLLE compatible bag. Perfect “Peace of Mind” readiness for emergencies. 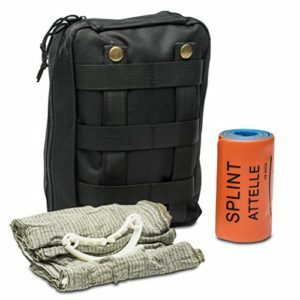 Compact, complete, well organized first aid medical kit..
Trauma kit in very sturdy tactical pouch. MOLLE compatible. Versatile for home or rigorous camping use. Perfect for hiking trips or to throw in your car for every day carry. * 2g CELOX Crystals, Hemostatic Agent for treatment of bleeding wounds. * 3-2 pack of Ibuprofen 200 mg, pain reliever/fever reducer. * 50 count box, Cotton Swabs. * 3-2 pack of Aspirin 325 mg pain reliever/fever reducer (NSAID). * 5 Small 2 inch x 2 inch, Gauze Pads. * 1 Povidone Iodine Antiseptic Swab, First aid antiseptic and germicide to help prevent infection in minor cuts, abrasions, minor burns. * 1-1 inch x 10 yds. Roll paper tape. * 1-3 inch Elastic Bandage. * 80 Assorted sheer bandages, small, medium, large. * 20 Alcohol Prep Swabs. * 3 packs, (0.5g each) Triple Antibiotic Ointment, Each gram contains Bacitracin Zinc 400 units, Neomycin Sulfate 5 mg, Polymicin-B Sulfate 5000 units. * 1 pair Nitril Exam Gloves. * Velcro “Red Cross” patch. Excellent value for the money. Keep one in your FactorXBag or one in each car! ISRAELI BANDAGE – Emergency wound dressing used to reduce blood loss. Commonly found in GI Issue first aid kits. 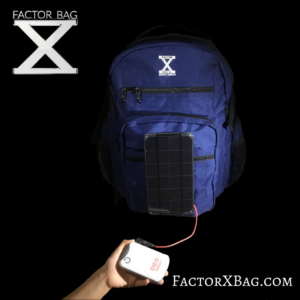 Here are a few other solar panel kits you could use with the FactorXBag. These items will not conveniently snap onto the bag like the Voltaic System will, however, they can attach to one of the many straps or rings on the pack. 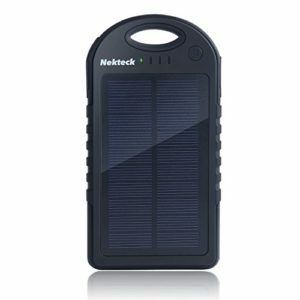 The first rain-resistant &shock-proof portable solar charger on the planet; Solar energy technology, environmental friendly and could recharge itself under sunshine for emergency purpose when outside;Shock-proof feature ensures the device working properly even it crashes or drops. Grade A cell, High Capacity, Build-in 12000mAh Lithium Polymer battery which charges via a powerful 1.2W monocrystalline solar panel ;2.1A output allows for simultaneous charging of your devices at high speed Anti-explosion, lightweight, compact and reliable, 1000+ recharge cycles over the life of the battery. As we all know in the survival world, without water we die. Knowing this, we should make sure we have a few ways to provide ourselves with clean potable water while in a survival situation. 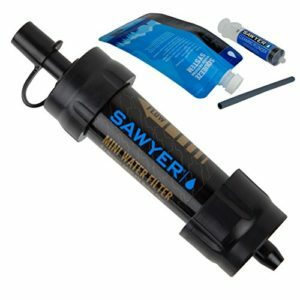 I recommend to have a Sawyer filter, a LifeStraw, and water purification tablets, this way you can make sure to be able to stay hydrated and free of any stomach issues. 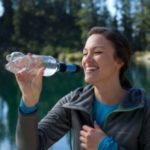 I wanted to start with the Sawyer filter, as I think it is the most versatile and affordable filter on the market. See the gallery below for a few suggested uses. I really love this filter and think that it is a true survival workhorse! 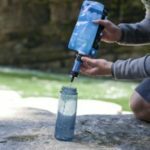 Collect water on the go when at a source and filter it later. 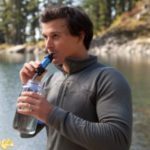 You can use it in your hydro pack allowing you to capture large amounts of water when at a source and filter it as you drink. We love these fire kits from Pine Fire! 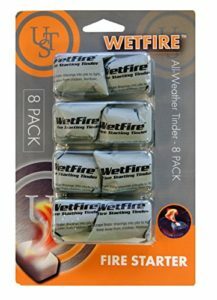 It comes in a great tin, which makes it really easy for you to adapt this into a full fire starting kit. All you need to do is add a few items from your survival kit to this box and you have a one-stop shop! 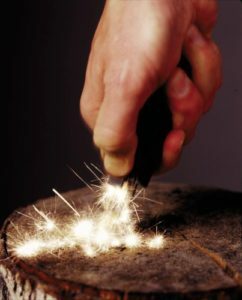 Just add a fire steel, a few waterproof or strike-anywhere matches, and you are good to go! Learn how to make this into a full fire kit here! Pine Fire has always strived to be a leader in the fire starting marketplace with products built clearly with the concepts of versatility and functionality in mind. To showcase these two cornerstones, we are proud to introduce the “TOT BOX”. 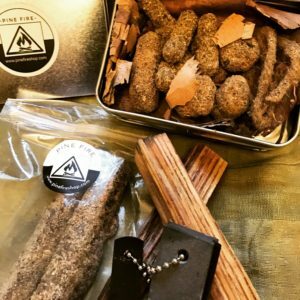 This wonderful bit of kit, 4.75″L x 3.38″W x 1.5″H tin lined with River Birch, comes packed with 2 pieces of fatwood, 1 ft of “DIRTY JUTE”, 7x “MICRO TOTS” and 2x “LARGE TOTS”. Per our usual, this too comes with our extra free fatwood on the side. Not only will you have the versatility of a water resistant, go anywhere carrying case, but you will now have the added bonus of a tin that aides you with the all important “next fire mentality” by offering you the perfect charring vessel. Once you enter into the preparedness world, you find yourself always trying to improve your training, knowledge, and gear. Many of us plan to bug out when trouble hits and others plan on sheltering in place to ride out what’s before us. In either of these scenarios, you will always have the need to carry and organize your gear. I am a strong believer in buying preps that I can actually use in my daily life whenever possible. This helps me to digest and justify the rather huge financial dedication it takes to prepare and become self-sufficient. Don’t get me wrong, there are a lot of ways you can prepare on the cheap and you should look to save money whenever possible. That being said, the FactorXBag is a bag that I can use everyday. It offers me the ability to carry my survival gear and my work supplies in one convenient and organized pack. The fact that it blends into my environment and doesn’t scream “Prepper” is a huge bonus to me. Why do we prepare? We prepare so we can survive and thrive in any situation. With the growing rate of active shooter situations in our world today, I believe this bag gives me a huge advantage to survive. The ability to carry armor panels with me without causing alarm or attracting unwanted attention is worth the price of this bag alone. I am excited to watch this company and product evolve and grow. The owner Todd is an incredibly passionate and creative person, and I know he has a lot more to offer the preparedness community.